Mikey’s Family. Believe the photo may be from 1982. I’m old enough to remember when Christmas had a lot more different meaning than it does today. I’ve not seen this picture in many years. I guess you can imagine who is me in this photo… Yep… the young man on the left being a camera ham! Go Figure! I remember that year I got a Superman PJ’s… Yep I thought I could fly. My sister in the middle got a Mr Professor Calculator and my brother sitting on Grampa’s lap got a stuffed Ernie Doll. I am fairly certain today, if I was this young now… I would expect something electronic, cyber and pretty expensive. It almost seems too pure and a time that never really existed by today’s standards. It’s too good to be true I know. Daniel and I now celebrate Christmas quietly together. We decorate our home. On a personal point of view, it’s important to me that some of the decorations we have up are homemade and made by Daniel and I. Daniel does amazing ornamental displays and I crochet up some fun projects for display. It’s what we do. Most people can agree that commercialism has taken over all of the holidays. My way of reclaiming it back is through making some of the projects myself. Sure I can buy a place mat or some of the items seen in my free pattern links below… but I am very capable of doing it myself and can put my own spin into the project. 6 Christmas Patterns that Make For A Homemade Christmas. Like I have said every year here on The Crowd, incorporate your crochet abilities to be part of your home decor. It has a lot of meaning. I have found you 6 patterns that you can do to make your Christmas a Homemade Holiday Theme – Click Here To Get Them. This entry was posted in Christmas and tagged Christmas, Craft, Crochet, crochet crowd, DECORATIONS, Free Crochet patterns, Gift, Holiday, Mikey. Bookmark the permalink. After my husband died, we had to re-examine just what we were doing for Christmas. Money was definitely an issue and drove how we would celebrate. We could make things for Christmas (my daughter made me a great book with hand written recipes that was very special. This year, I’m making hats for our extended families. We would buy gifts for my Grandchildren but we couldn’t exceed $65… the rest of us would be together with good food, watching the kids open gifts and playing Wii for hours. Christmas like this is so much more meaningful and less stressful. Thanks for sharing! I enjoy the simple things of Christmas. I enjoy decorating, my husband and I go and cut our own tree. He puts the tree up and I decorate it. I also enjoy baking. I managed to find all of my mom’s cookie recipes, which was no easy feat. This year I’m planning on making snowflakes to hang around the house as well as on the tree. I’m also going to make some to hang on the memory tree out in my back yard. I love making things for friends and family. Some of the patterns I use push me out of my comfort zone. 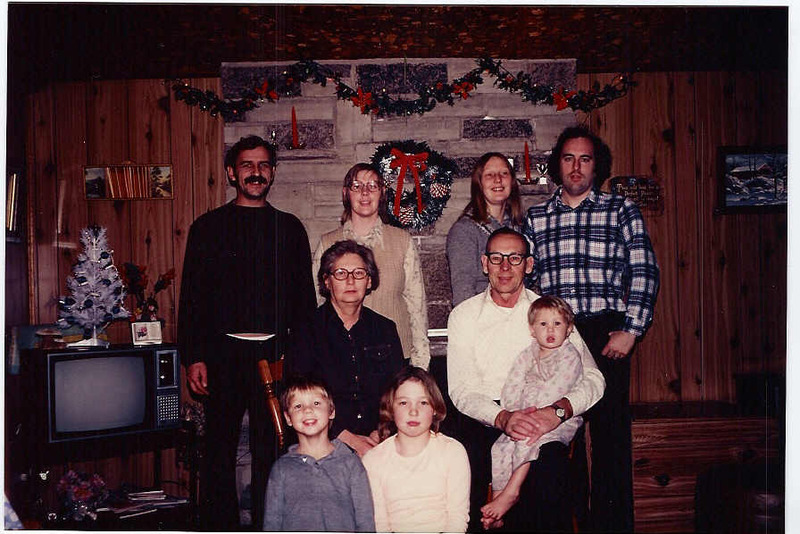 Nice family photo…the kids today are totally spoiled and have no idea what a true family holiday is…they never look up or interact with their families ….oh for the simple life like we had as children…. I agree with you 100% Rosalie. It’s also the parents and societies fault. Handmade or homemade things are seen as “cheap”, not made with love and thought. It’s too bad kids can’t be kids today. My Christmases are a lot quieter too. All the nieces and nephews moved out of state. I love how Mikey described his Christmas in 1982! Simpler times indeed. Talking about homemade crochet gifts. I had a friend from grade school post a picture of a hybiscus flower that my grandma crocheted for all the Room Mothers back then….circa 1978. I was floored and flattered! There was my grandmas handi work on my friends tree up on Facebook. it touched my heart. Grandma passed on at age 95 in 1999. One thing is I have learned to appreciate all the hard work she put into her projects. She used show off her handi work to company and they would oooh and haa or at least pretend they liked it. I stood by and rolled my eyes. Again… Now I love Facebook and other platforms where we can show off our creativity and get some thumbs up. Back then face to face was the only way to connect or maybe with a polaroid LOL. I am just like her now! Making things for Christmas. Once I learned to crochet everyone got crocheted gifts for Christmas. I gave everything from hats and scarves to affies. I also sewed up Christmas decorations and gave homemade candy and cookies. My Christmases are a lot quieter these days. Occasionally I will crochet some dish clothes. I don’t bake or make candy anymore. I don’t even decorate any more. But I still like to see all the new crochet patterns, I even collect Christmas patterns in hopes that one day I may use them. Mikey, you are right about the face of Christmas changing. It’s always, more presents and how much did you pay for it. Christmas seems to start earlier and earlier every year, usually before Halloween. There are many times I wish we could go back to a more simple way of life, but I’ll admit that I’d totally miss my electronic gadgets! Mikey, thanks so much for sharing your family Christmas picture and your own personal thoughts.